Brazil's biggest construction firm, Odebrecht, has admitted in the US to bribing officials to secure contracts. The company and Brazilian petrochemical firm, Braskem, have agreed to pay at least $3.5bn (£2.8bn) to the authorities in the US, Brazil and Switzerland. The US Justice Department said it was the largest foreign bribery case yet. Odebrecht will pay fines of at least $2.6bn and Braskem will pay $957m for bribery across the globe. One of the biggest examples of corruption involved Odebrecht paying bribes to officials of Brazil's state-run oil company, Petrobras, which is itself at the centre of a huge corruption scandal. Odebrecht executives have signed a deal to cooperate with that investigation into Petrobras - known as Operation Car Wash - naming more than two hundred politicians allegedly involved in the kickback scheme. 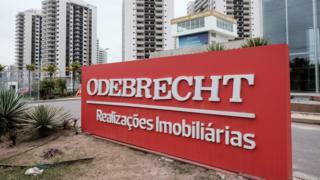 William Burck, a lawyer for Odebrecht, said the company was "glad to be turning the page and focusing on its future". Earlier in December, the company apologised for being part of corruption scandals that have already led to its former chief executive, Marcelo Odebrecht, being sent to jail for 19 years for paying $30m (£21m) in bribes to Petrobras officials. US deputy assistant attorney general, Sung-Hee Suh, said: "Odebrecht [the firm] and Braskem used a hidden but fully functioning Odebrecht business unit - a 'Department of Bribery,' so to speak - that systematically paid hundreds of millions of dollars to corrupt government officials in countries on three continents." The US authorities said that starting in 2001, and lasting for more than a decade, Odebrecht paid $788m (£627m) in bribes to government officials, their agents and to political parties in several countries, to win business orders. The US Department of Justice said: "The criminal conduct was directed by the highest levels of the company, with the bribes paid through a complex network of shell companies, off-book transactions and off-shore bank accounts." Braskem took part in the scheme and between 2006 and 2014, and paid about $250m (£201m) into Odebrecht's bribery system, US authorities said. The money was used to bribe politicians and their parties in Brazil as well as to officials of Petrobras. The result, said the US Justice Department, was that Braskem obtained cheap deals when buying Petrobras materials, obtained contracts with Petrobras, and also gained sweetheart tax deals in Brazil. "These resolutions are the result of an extraordinary multinational effort to identify, investigate and prosecute a highly complex and long-lasting corruption scheme that resulted in the payment by the defendant companies of close to a billion dollars in bribes to officials at all levels of government in many countries," said US attorney Robert Capers. "In an attempt to conceal their crimes, the defendants used the global financial system - including the banking system in the United States - to disguise the source and disbursement of the bribe payments by passing funds through a series of shell companies," he added. Braskem is jointly owned by Odebrecht and Petrobras.